Viivi is a Director in FRA’s Helsinki office. She has almost 10 years of experience working on complex investigations, damage calculations, compliance audits and contentious insolvency as well as accounting malpractice issues. She has also acted as an expert witness and as a speaker at numerous industry events. 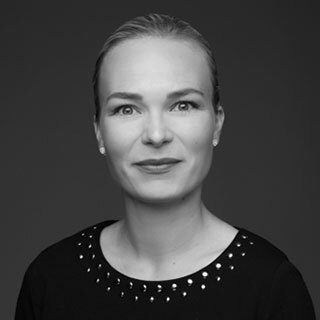 Viivi has worked on international projects both within the private and public sector and has in-depth experience across a range of industries including banking and finance, life science, insurance, energy, construction and manufacturing. Prior to joining FRA, Viivi was Head of Audit at the Ministry of Education and Culture, where she had a significant role in the improvement process related to audit functions and in the government’s grant process overall. Her work, and its results, have also been widely visible in the Finnish media. Viivi has worked in the Fraud Investigations and Dispute services team at EY, as well as at Deloitte and RSM Finland. Viivi holds a Master of Science degree in accounting and corporate law from Lappeenranta University of Technology and is currently studying for a degree in Licentiate of laws (procedural and insolvency law).